Interested in joining? Fill out this application and please attend our monthly business meeting on the 1st Thursday of each month. The Prince Frederick Volunteer Rescue Squad is hosting an Open House in our new building to celebrate Emergency Medical Services week! Please join us on Saturday, May 18, 2019 from 10am to 4pm. Come on out and meet your local volunteers that serve our community! We will have multiple public service agencies presenting and all kinds of fun activities! PFVRS is hosting a Dinner and Dance! 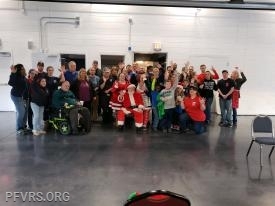 Breakfast with Santa was a success!!! 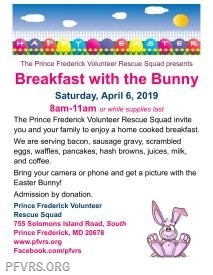 The Prince Frederick Volunteer Rescue Squad is back at home in our new building and we want to invite you and your family to enjoy a home cooked breakfast.